The Cambodian genocide (Khmer: របបប្រល័យពូជសាសន៍) was carried out by the Khmer Rouge (KR) regime led by Pol Pot between 1975 and 1979 in which an estimated one and a half to three million people died. As the Cambodian Civil War resulted in the establishment of Democratic Kampuchea by the victorious Khmer Rouge, KR planned to create a form of agrarian socialism, founded on the ideals of Stalinism and Maoism. The subsequent policies forced relocation of the population from urban centers, torture, mass executions, use of forced labor, malnutrition, and disease led to the deaths of an estimated 25 percent of the total population (around 2 million people). The genocide ended in 1979 following the Vietnamese invasion of Cambodia. As of 2009, 23,745 mass graves have been discovered. On 2 January 2001 the Cambodian government passed legislation to try a limited number of the KR leadership. Trials began on 17 February 2009. On 7 August 2014, Nuon Chea and Khieu Samphan were convicted and received life sentences for crimes against humanity during the genocide. Professionals and intellectuals—in practice this included almost everyone with an education, people who understood a foreign language and even people who required glasses. Ironically and hypocritically, Pol Pot himself was a university-educated man (albeit a drop-out) with a taste for French literature and was also a fluent French speaker. Many artists, including musicians, writers and film makers were executed. Some like Ros Sereysothea, Pan Ron and Sinn Sisamouth gained posthumous fame for their talents and are still popular with Khmers today. "Economic saboteurs": many of the former urban dwellers (who had not starved to death in the first place) were deemed to be guilty by virtue of their lack of agricultural ability. Some 17,000 people passed through Tuol Sleng Centre (also known as S-21) before they were taken to sites (also known as The Killing Fields), outside Phnom Penh such as Choeung Ek where most were executed (mainly by pickaxes to save bullets) and buried in mass graves. Of the thousands who entered Tuol Sleng only seven are known to have survived. Tuol Sleng was only one of some 196 prisons operated by the Khmer Rouge. Between 327,000 and 541,000 ethnic and religious minorities in Cambodia are estimated to have been killed by the Khmer Rouge's genocides against them. The Khmer Rouge regime targeted various ethnic groups during the genocide, forcibly relocating minority groups, and banned the use of minority languages. One estimate is that out of 40,000 to 60,000 monks, only between 800 and 1,000 survived to carry on their religion. We do know that of 2,680 monks in eight monasteries, a mere seventy were alive as of 1979. As for the Buddhist temples that populated the landscape of Cambodia, the Khmer Rouge destroyed 95 percent of them, and turned the remaining few into warehouses or allocated them for some other degrading use. Amazingly, in the very short span of a year or so, the small gang of Khmer Rouge wiped out the center of Cambodian culture, its spiritual incarnation, its institutions. ... As part of a planned genocide campaign, the Khmer Rouge sought out and killed other minorities, such as the Moslem Cham. In the district of Kompong Xiem, for example, they demolished five Cham hamlets and reportedly massacred 20,000 that lived there; in the district of Koong Neas only four Cham apparently survived out of some 20,000. All 10,000 Vietnamese in Cambodia who were not already repatriated were killed by the Khmer Rouge. Under the leadership of Pol Pot, who was an ardent atheist, the Khmer Rouge had a policy of state atheism. All religions were banned, and the repression of adherents of Islam, Christianity, and Buddhism was extensive. Nearly 25,000 Buddhist monks were massacred by the regime. According to Ben Kiernan, the "fiercest extermination campaign was directed against the ethnic Cham Muslim minority". This attempt at the purification of Cambodian society along racial, social and political lines led to the purging of the military and political leaders of the former regime, along with the leaders of industry, journalists, students, doctors and lawyers as well as members of the Vietnamese and Chinese ethnic groups. The exact number of Cham people killed is unknown; however, Ben Kiernan estimates at least 87,000 deaths, or almost 36% of the population however others estimate based on a much larger estimated population a death toll between 400 and 500 thousand or around 70% of their population though these numbers have been criticized. Another source estimates 125,000 deaths based on a population of 250,000 or a 50% proportional killing. Autogenocide is "the mass killing by a government or regime of a section of its own people". The term was coined in the latter half of the 1970s to describe the actions of the Khmer Rouge government of Cambodia, to distinguish such acts from the genocide of groups considered "other" by a government, such as the killing of Jews and people of Slavic origin by Nazi Germany. According to Samuel Totten, 25% of the urban Khmer population (500,000 people killed) perished under the Khmer Rouge, while rural Khmers lost 16% (825,000 people killed) of their population, putting the killing at a scale comparable to genocide of Roma (25% of the Roma population of Europe, 130,000–500,000 people) and the genocide of Serbians (300-000–500,000 Serbs) during the Holocaust drawing the comparison to genocide aforementioned. Ideology played an important role in the genocide. The desire of the KR to bring the nation back to a "mythic past", the desire to stop aid from abroad from entering the nation, which in their eyes was a corrupting influence, the desire to restore the country to an agrarian society, and the manner in which they tried to implement this goal were all factors of the genocide. One KR leader said, it was for the "purification of the populace" that the killings began. Pol Pot and the KR forced virtually the entire population of Cambodia into mobile work teams. Michael Hunt said that it was "an experiment in social mobilization unmatched in twentieth-century revolutions." The KR used an inhumane labor regime, instilled fear and terror in order to keep the population in line, starvation, upheaval and resettlement, and collectivization of land. Ben Kiernan compares three genocides in history, the Armenian Genocide, the Holocaust and the Cambodian genocide, which although unique shared certain common features. Racism is one and was a major part of the ideology of all three regimes. Although all three perpetrators were largely secular, they targeted religious minorities. All three also tried to use force of arms to expand into a "contiguous heartland" (Turkestan, Lebensraum, and Kampuchea Krom), all three regimes also "idealized their ethnic peasantry as the true 'national' class, the ethnic soil from which the new state grew." In 1977 the book Cambodge année zéro written by François Ponchaud was released, although the English translation was not published until 1978. Ponchaud was one of the first authors to bring the genocide to the world's attention. Ponchaud has said of the genocide that it "was above all, the translation into action the particular vision of a man [sic]: A person who has been spoiled by a corrupt regime cannot be reformed, he must be physically eliminated from the brotherhood of the pure." In 1977, Murder of a gentle land: the untold story of a Communist genocide in Cambodia, written by John Barron and Anthony Paul, was published. The book drew on accounts from refugees, and after an abridged version was published in Reader's Digest, it was widely read. In 1973, Kenneth M. Quinn, serving with the U.S. embassy, had raised concerns over the atrocities being carried out. In a report, he stated that the KR had "much in common with those of totalitarian regimes in Nazi Germany and the Soviet Union". Quinn has written of the KR that "[w]hat emerges as the explanation for the terror and violence that swept Cambodia during the 1970s is that a small group of alienated intellectuals, enraged by their perception of a totally corrupt society and imbued with a Maoist plan to create a pure socialist order in the shortest possible time, recruited extremely young, poor, and envious cadres, instructed them in harsh and brutal methods learned from Stalinist mentors, and used them to destroy physically the cultural underpinnings of the Khmer civilization and to impose a new society through purges, executions, and violence." The support of North Vietnam, in conjunction with China, was essential to the triumph of the KR in the Cambodian civil war. During the genocide, China was the main international patron of the KR, supplying more than 15,000 military advisers and most of their external aid. As a result of Chinese and Western opposition to the Vietnamese invasion, the KR retained Cambodia's UN seat until 1982. China hosted KR military training camps from 1979 until at least 1986, and stationed military advisers with KR troops until as late as 1990. After the 1991 Paris Peace Accords, Thailand continued to allow KR guerillas to trade and move across the Thai border, although criticism from the U.S. and Australia caused it to disavow passing any direct military support. Ben Kiernan claimed that the US offered material support to the Khmer Rouge after the Vietnamese invasion. Other sources have disputed these claims. As of 2009, the Cambodian NGO Documentation Center of Cambodia has mapped some 23,745 mass graves containing approximately 1,386,734 suspected victims of execution; execution is believed to account for roughly 60% of the full death toll. On 15 July 1979, following the overthrow of the KR, the new government passed "Decree Law No, 1". This allowed for the trial of Pol Pot and Ieng Sary for the crime of genocide. They were given an American defence lawyer, Hope Stevens. They were tried in absentia and convicted of genocide. 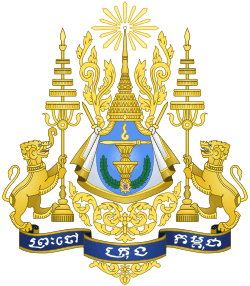 In January 2001, the Cambodian National Assembly passed legislation to form a tribunal to try members of the KR regime. Such a tribunal was constituted as the Extraordinary Chambers in the Courts of Cambodia. The tribunal has been criticised for being slow, as only three people have been convicted. Among others tried by the tribunal, another died during his trial, and a fifth was found unfit to stand trial. Kang Kek Iew, known as Comrade Duch or Hang Ping, was a mid level leader of the KR regime. He set up the first Khmer prison (code name M-13) in Kampong Forest, where the prisoners had to live in pits. He set up another prison two years later, known as M-99. It is estimated that up to 20,000 people were tortured and executed there. Following the Khmer Rouge victory in April 1975, the prison system was extended nationwide, and in Phnom Penh the infamous Tuol Sleng prison (S-21 prison) was founded. Duch was in charge of the prison, together with his lieutenants Mam Nai and Tang Sin Hean, who led the torture and interrogation of prisoners. It is estimated that 16,000 people were killed within the Tuol Sleng compound with only seven known survivors. In 1999, Duch was interviewed by Nic Dunlop and Nate Thayer, in which he admitted his guilt over the crimes carried out in Tuol Sleng. He expressed sorrow for his actions and stated he was willing to stand trial, and give evidence against his former comrades. On 16 February 2009 the trial began, and he accepted that he was responsible for the crimes carried out at Tuol Sleng, on 31 March 2009. On 26 July 2010 he was found guilty on charges of crimes against humanity, torture and murder and was given a sentence of 35 years' imprisonment. On 3 February 2012 his previous sentence was replaced with life imprisonment. On 19 September 2007, Nuon Chea, known as Brother Number Two, was arrested, and later arraigned before the ECCC. At the end of the trial in 2013 he denied all charges, stating that he had not given orders "to mistreat or kill people to deprive them of food or commit any genocide". He was convicted in 2014 and sentenced to life imprisonment. He has expressed remorse and accepted moral responsibility for the crimes, stating "I would like to sincerely apologize to the public, the victims, the families, and all Cambodian people." Ieng Sary was arrested on 17 November 2007 and charged with crimes against humanity. He died of heart failure in 2013 before his trial could reach a verdict. Ieng Thirith was arrested on 12 November 2007 at the same time as her husband, Ieng Sary. She was indicted on 10 September 2010, for crimes against humanity and genocide. On 17 November 2011, following evaluations from medical experts, she was found to be unfit to stand trial due to a mental condition. Khieu Samphan was arrested on 19 November 2007 and charged with crimes against humanity. He was convicted in 2014 and sentenced to life imprisonment. A few months before his death on 15 April 1998, Pol Pot was interviewed by Nate Thayer. During the interview he stated that he had a clear conscience and denied being responsible for the genocide. Pol Pot asserted that he "came to carry out the struggle, not to kill people". According to Alex Alvarez, Pol Pot "portrayed himself as a misunderstood and unfairly vilified figure". In 2013, the Cambodian Prime Minister Hun Sen passed legislation which makes illegal the denial of the Cambodian genocide and other war crimes committed by the Khmer Rouge. The legislation was passed after comments by a member of the opposition, Kem Sokha, who is the deputy president of the Cambodian National Rescue Party. Sokha had stated that exhibits at Tuol Sleng were fabricated and that the artifacts had been faked by the Vietnamese following their invasion in 1979. Sokha's party have claimed that the comments have been taken out of context. According to Deirdre Boyle, Rithy Panh, "who is considered by many to be the cinematic voice of Cambodia, is himself a survivor of the Khmer Rouge's killing fields. Arguably his best known and most affecting documentary is S-21: The Khmer Rouge Killing Machine, in which he recuperates memory to represent speechless horror and thereby shatter silence. With its unsettling reenactments, S-21 allows us to observe how memory and time may collapse to render the past as present and by doing so reveal the ordinary face of evil." Loung Ung recounted the genocide in her memoir First They Killed My Father (2000). The genocide is portrayed in the 1984 drama film The Killing Fields and Patricia McCormick's novel Never Fall Down] (2012). The genocide is referenced satirically in the Dead Kennedys song "Holiday in Cambodia". ↑ Frey 2009, p. 83. ↑ Etcheson 2005, p. 119. ↑ Heuveline 1998, pp. 49-65. ↑ Mayersan 2013, p. 182. ↑ Seybolt, Aronson & Fischoff 2013, p. 238. ↑ Mendes 2011, p. 13. ↑ "Cambodia's brutal Khmer Rouge regime". BBC News. September 19, 2007. ↑ "Mapping the Killing Fields". Documentation Center of Cambodia. Retrieved 2016-09-10. White, Matthew. "20th Century death tolls larger than one million but fewer than 5 million people-Cambodia". necrometrics. 1 2 3 Gellately, Robert; Kiernan, Ben (2003). The Specter of Genocide: Mass Murder in Historical Perspective. Cambridge University Press. pp. 313–314. 1 2 Kiernan, Ben (2008). The Pol Pot regime: Race, Power, and Genocide in Cambodia under the Khmer Rouge. Yale University Press. p. 431. ↑ Hinton, Alexander Laban (2005). Why Did They Kill? Cambodia in the Shadow of Genocide. University of California Press. p. 54. ↑ Chan, Sucheng (2003). Remapping Asian American History. Rowman & Littlefield. p. 189. ↑ Alvarez 2001, p. 12. ↑ White, Matthew. "20th Century death tolls larger than one million but fewer than 5 million people-Cambodia". necrometrics. ↑ Niewyk, Donald L.; Nicosia, Francis R. (2000). The Columbia Guide to the Holocaust. Columbia University Press. p. 47. ISBN 978-0-231-50590-1. Retrieved 5 July 2016. ↑ Žerjavić, Vladimir (1993). Yugoslavia - Manipulations with the number of Second World War victims. Croatian Information Centre. ISBN 0-919817-32-7. ↑ Alvarez 2001, p. 50. ↑ Alvarez 2007, p. 16. ↑ Hannum 1989, pp. 88-89. 1 2 3 Hunt, Michael H. (2014). The World Transformed: 1945 to the Present. New York, NY: Oxford University Press. p. 377. ISBN 978-0-19-937102-0. ↑ Kiernan 2003, p. 29. ↑ Beachler 2011, p. 45. ↑ Bartrop 2012, p. 261. ↑ Tyner 2012, p. 145. ↑ Mayersan 2013, pp. 183-184. ↑ Power 2002, p. 96. ↑ Hinton & Lifton 2004, p. 23. ↑ SarDesai 1998, p. 124. ↑ Roett 2008, p. 193. 1 2 PoKempner 1995, p. 106. ↑ PoKempner 1995, p. 107-108. ↑ Kiernan, Ben (April 2005). "The Cambodian Genocide and Imperial Culture". 90 Years of Denial. Aztag Daily (Beirut) and Armenian Weekly (Boston). pp. 20–21. Retrieved 15 September 2012. ↑ "Pol Pot's Evil Had Many Faces; China Acted Alone". The New York Times. 22 April 1998. ↑ Nate Thayer, "Cambodia: Misperceptions and Peace", Washington Quarterly, Spring 1991. "There is no evidence that the US gave any material support whatsoever to the Khmer Rouge." ↑ Stephen J. Morris, "Vietnam’s Vietnam", Atlantic Monthly, January 1985, "ABC Flacks For Hanoi", Wall Street Journal, 26 April 1990. ↑ "Skeletons in the Closet", The New Republic, 4 June 1990. ↑ Sharp, Bruce (2008-06-09). "Counting Hell". Retrieved 2016-09-23. ↑ Seybolt, Aronson & Fischoff 2013, p. 238. This source gives a slightly lower figure of 1,298,772, but that is the authors' "own calculation based on Internet data" and appears to be an undercount..
↑ Etcheson 2005, p. 14. ↑ Donlon 2012, p. 103. ↑ Stanton 2013, p. 411. ↑ Bartrop 2012, pp. 166-167. ↑ Corfield 2011, p. 855. ↑ de los Reyes et al. 2012, p. 1. ↑ Chan 2004, p. 256. ↑ Alvarez 2001, p. 56. ↑ Boyle 2009, p. 95. Alvarez, Alex (2007). "The Prevention and Intervention of Genocide During the Cold War Years". In Samuel Totten. The Prevention and Intervention of Genocide. Transaction. pp. 7–30. ISBN 978-0765803849. Boyle, Deirdre (2009). "Shattering Silence: Traumatic Memory and Reenactment in Rithy Panh's S-21: The Khmer Rouge Killing Machine". Framework: The Journal of Cinema and Media. Wayne State University Press. 50 (1/2): 95–106. doi:10.1353/frm.0.0049. JSTOR 41552541. Corfield, Justin J. (2011). "Nuon Chea". In Spencer C. Tucker. The Encyclopedia of the Vietnam War A Political, Social, and Military History. ABC-CLIO. ISBN 978-1-85109-961-0.
de los Reyes, Faith Suzzette; Mattes, Daniel; Lee, Samantha B.; Van Tuyl, Penelope (2012). KRT TRIAL MONITOR (PDF). Asian International Justice Initiative. Donlon, Fidelma (2012). "Hybrid Tribunals". In William A. Schabas, Nadia Bernaz. Routledge Handbook of International Criminal Law. Routledge. pp. 85–106. ISBN 978-0415524506. Hannum, Hurst (1989). "International Law and Cambodian Genocide: The Sounds of Silence". Human Rights Quarterly. The Johns Hopkins University Press. 11 (1): 82–138. doi:10.2307/761936. JSTOR 761936. Heuveline, Patrick (1998). "'Between One and Three Million': Towards the Demographic Reconstruction of a Decade of Cambodian History (1970-79)". Population Studies. Taylor & Francis. 52 (1): 49–65. doi:10.1080/0032472031000150176. JSTOR 2584763. Kiernan, Ben (2003). "Twentieth-Century Genocides Underlying Ideological Themes from Armenia to East Timor". In Robert Gellately, Ben Kiernan. The Specter of Genocide: Mass Murder in Historical Perspective. Cambridge University Press. ISBN 978-0521527507. Mayersan, Deborah (2013). ""Never Again" or Again and Again". In Deborah Mayersen, Annie Pohlman. Genocide and Mass Atrocities in Asia: Legacies and Prevention. Routledge. ISBN 978-0415645119. Munthit, Ker (19 November 2007). "Ex-Khmer Rouge Head of State Charged". Associated Press. Retrieved 7 January 2014. Roett, Riordan (2008). China's Expansion Into the Western Hemisphere: Implications for Latin America and the United States. Brookings Institution Press. ISBN 978-0815775546. Stanton, Gregory H. (2013). "The Call". In Samuel Totten, Steven Leonard Jacobs. Pioneers of Genocide Studies. Transaction. pp. 401–428. ISBN 978-1412849746. Waller, James. "Communist Mass Killings: Cambodia (1975-1979)". Keene State College. Cohen Center, Keene, NH. 17 February 2015. Powerpoint Lecture.